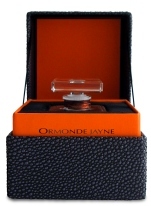 Orris Noir is the latest fragrance from the London boutique Ormonde Jayne. Orris Noir is named for the Black Iris of Amman, Jordan's national flower, and the notes feature davana (an aromatic herb also used in Ormonde Jayne Osmanthus), pink pepper, coriander seed, cardamom, bergamot, iris, jasmine sambac absolute, pimento berries, bay, saffron, incense, myrrh, patchouli, cedar and gaiac wood. Orris Noir starts with a good dose of the pink pepper that appears in several other Ormonde Jayne fragrances, and is especially noticeable in Ta'if and Isfarkand. The spiciness picks up speed as it dries down and the other notes join in, but it is not overwhelmingly spicy: this is a fragrance that whispers rather than screams. The heart is a lovely blend of jasmine and iris, very soft and plush, over a warm base of woods and resins. I feared from the name and the list of notes that it would be a darker and heavier fragrance than I would like, but it is neither dark nor heavy: it is not so light in spirit as Ormonde Jayne Frangipani or Champaca, but nor is it as dark as Tolu or Ormonde. I would call it dusky, like Ta'if, and it shares a bit of Ta'if's sultry, come-hither quality. It also recalls Escentric 01 by Escentric Molecules, a fragrance that I originally compared to Ormonde Jayne's Isfarkand, but here the resemblance is even more obvious. Orris Noir is a considerably deeper, richer, and more complex fragrance, but the woody-musky base accented by iris and incense is strikingly similar. Orris Noir is not ever going to be my favorite from the Ormonde Jayne line — Frangipani is firmly entrenched in that position — but it is a lovely fragrance. Whether I will fall in love with it remains to be seen. I was slow to warm up to Ta'if, for that matter, and it is now a regular in my fall rotation. Of course, Ormonde Jayne fans will want to try Orris Noir, but then, Ormonde Jayne fans already knew that. If you've never tried any of the Ormonde Jayne fragrances, the sample set is, in my very humble opinion, worth every penny. For buying information, see the listing for Ormonde Jayne under Perfume Houses. Bonus reading: an interview with Linda Pilkington, the founder of Ormonde Jayne. And for another take on Orris Noir, see Marina's review at Perfume-Smellin' Things. “This is a fragrance that whispers rather than screams”. There, you summed up my feelings about this scent in one sentence. And here is where the evil-twinness comes in, you *feared* it would be dark and heavy, and I *hoped* it would be Thank you very much for a great review. Great review, Robin! I saw the similarity with Ta'if, too. Like Marina, I wanted it to be more noir but I love it nonetheless. We have ESP! I just clicked on your site in my Bloglines listing and thought ” I wonder when she's going to review Orris Noir?” and here it is!! I absolutely love this one and I agree with you in your placement of ON among the other OJ scents. I find Ta'if and Sampaquita to be a bit too suffusing/heady/dusky somehow in their floral notes—but this one is not. It has a more vertical construction—a tiny bit of airiness that balances the whole compostion. I'm wearing it now and I've been wearing almost every day since I got it a couple of weeks ago. Now, if we can just get that other titan of perfume reviewers, Bois de Jasmin, to review it, too. I'm really eager to read her thoughts on the subject! Ok, I need to get my act together and try it. L, Funny that you also describe Sampaquita as heady & dusky — I found it one of the lighter of the bunch. I have to admit that it is the OJ that hasn't so far caught my attention in any way. I guess that means it is due for another try? I am curious what V will think too! Is that box the parfum box or is the EDP actually in stopper bottle form for this release? And do you know when the official release is? I read that article, but it made it sound like it would have been out at the end of July, for some reason. So far none of the OJ scents have been winners (Tolu came the closest) but I'd give this one a try based on what you said. Nice to see you again! OK. I will buy this thing. The anticipation is causing near-physical pain. Then I do hope that for your sake the USPS will be swift! Mmmmmmm….. Ina had me wanting it, Marina had me saying meh, now you have me wanting it again b/c you compared it to Ta'if, which I find myself head over heels about, even though it's (shudder) rose and outside my parameters… so I will have to try it! I don't love all the OJs, but there is nothing like them, and I love them just for that! ;-) Ta'if and Sampaquita are my favorites. It “feels” like Ta'if, but it doesn't smell like Ta'if. That is no help, is it? My favorites in order, just for fun: Frangipani, Champaca, tie between Tai'if and Osmanthus, Isfarkand, Ormonde, then poor Tolu & Sampaquita tied for last place. Robin, Zippy – I received a lovely email from Polly at Ormonde Jayne saying the Samples of Orris Noir will be available when the Eau de Parfum is launched in mid Sept. They will be happy to send just this sample, which thrilled me (I had purchased the sample set earlier). Your picture Robin is the 50ml bottle of pure Parfum (112 pounds sterling), and already released. I think T'iaf is my favourite so far, and has remained so from the first sniffed sample. I wanted to like Ormonde woman but always get tight chest pains shortly after wearing it. Orris Noir – oh, the wait is unbearable! Yes, don't worry — I knew what you meant about Ta'if! My poor Sampaquita, nobody loves her but me. She's an orphan, she sits next to my bottle of L'Eau Trois, another unloved frag…. but their beauty is just misunderstood! I really need to re-smell Champaca, I can't remember it. Agree that L'Eau Trois is misunderstood. Even I don't understand it, LOL…no, j/k, I think it is a great fragrance that is rather hard to wear. Sampaquita is in another category, as it isn't hard to wear at all. I do know others who love it so you aren't *quite* alone. Thank you so much for the clarification! If I ever knew the EdP wasn't out til Sept, I'd forgotten it entirely. Maybe I never knew. And tight chest pains from Ormonde — that is quite scary! I wonder what is causing it. It wouldn't be the hemock note, would it? Ah, that seems a likely culprit! Linda kindly sent me a sample of this… and I must say I agree firstly that it's in the same heady vein as Tolu and Ta'if (the latter being an all time favourite). Yes, it's dusky rather than dark, twilight rather than midnight, sweetly spicy, soft and plush, and like the above, has it's home in the Middle East:- that of 1001 Nights, Twilight at the Oasis and date palms by an azure sea, mosaic tiled palaces and bubbling fountains in moonlight. I find all these OJ's eminently wearable by a man (and I do!) and would swoon with delight if I smelt this on the nape of anyone! I tried my sample of this the other night while writing Christmas cards. After almost an hour wondering whether I liked it or not, I put nose to wrist and inhaled deeply…and decided it had morphed into Crest toothpaste. The original flavor paste–not the new gel. Really, Crest? Gosh, I don't even remember it as being minty in the least. Now I'll have to dig out my sample again to check! OK – I know the last post for this scent was way back – but i recently received my sample set, and LOVED Orris Noir. So I wanted to add my tuppence worth to the discussion! I didn't read about it before trying it, so had no idea what it contained. After wearing it for a few hours, i had a vague sense that something hot and spicy, like a chilli pepper, was involved somewhere!! It was quite hot and exciting! Frangipani is one of the most pleasurable, delightful, succulent, fresh and innocent scents ever. There is something so pure and radiant about it. It'll be the first scent i reach for on my wedding day. I bought a couple of beautiful atomisers on ebay, and was wondering if someone had advice about how to decant perfumes into them? Is there a knack? A funnel i need to buy? Advice from the experts would be much appreciated. thanks Robin for your great reviews. It's such a pleasure to share my love of perfumes with everyone on this website. Rachele, So glad your sample set is working out, that's great! On the bottom menu, click on “General Perfume Articles”, then do a search for “decant” and you'll find a whole article on “how to” — it's really easy. Thanks Robin. Much appreciated. And very helpful.